Try out the many wonders on offer in the Mostviertel region and benefit from the complimentary Card. Hiking, climbing, rafting, skiing and exercising at an altitude of 1,500 m. This JUFA Sport-Resort lies directly in the Göstling Alps, one of the most beautiful Alpine regions of Eastern Austria. Sports enthusiasts and active families will find ideal conditions at Hochkar. Winter and summer – the sports resort offers modern training facilities at the high-altitude sports centre for both professional and ambitious leisure sports enthusiasts. Sports enthusiasts will find indoors 4-way sports halls, a gymnasium, table tennis room and bowling alley; outdoors there is an artificial turf pitch and Fun court, a sprinting track and a hard court. With so much training, regeneration is an important subject! Therefore our Wellness areas with sauna, steam bath and infrared cabin pamper our guests. Massages loosen the muscles and are always bookable. Children’s play and active areas, a café with a sun terrace and an inn are a special incentive for families. By the way, dogs are welcome! Enjoy breathing the air on summer evenings and enjoy the great panorama – in clear weather conditions the view stretches from the Bohemian Forest to the Dachstein. Our tip: Let the day end cosily with a glass of wine under the stars! The JUFA Hotel Hochkar – Sport-Resort*** in Mostviertel is an ideal seminar hotel due to its modernly equipped seminar and workshop rooms with free WLAN, charming surroundings and numerous sports facilities. In winter, the popular Hochkar Ski Resort offers well prepared slopes and snow guaranteed areas for winter sports enthusiasts. The Ybbstaler Salt Water Spa can be reached quickly by bus from the JUFA hotel and is definitely worth a visit. Guided hikes, the Hochkar lifts and 157 km of marked hiking trails make the Hochkar a popular hiking area for all age groups. Rafting, high-ropes course, climbing routes and cave trekking are other leisure activities during the warm season. The Hochkar Cave is an exciting excursion destination for children: With a total length of 500 m it is one of the deepest caves in Lower Austria. The JUFA Hotel Hochkar – Sport Resort*** is located in the east of Austria, just a few kilometres from the market town of Göstling. It is a perfect base from which to embark on infinite adventures and can be reached easily by car. Guests can make use of the free parking spaces for cars and buses. Take the MO1 and MO13 lines from Waidhofen to the JUFA Hochkar Sport Hotel (“Talstation Hochkar Bergbahnen“). In the cross-country skiing centre Panoramaloipe Hochreit, there are six cross-country ski runs. Light or medium difficulty, classic cross-country skiing or skating: Here you will find the right trail for your requirements whether you are a leisurely cross-country skier or a professional. The Hochkar Ski Resort operates 8 modern lifts and 2 conveyors. On 19 kilometres of slopes you can move through a unique Lower Austrian panorama. Incidentally, the Hochkar is known in Austria as a World Cup runners preparation ground. Enjoy high snow guarantee and the comfortable retreats. The Mendlingtal Erlebniswelt is one of the last “Holztrift” (literally “wood drift”) facilities in Austria. This is where the wood that was felled and had drifted down the streams and rivers would be collected and stored. You will find yourself on what is called the “Holzweg” or “wood way”. There is much to discover on the themed walks, including the Schmiedegesellenhaus (blacksmith’s) Museum, the Venetian sawmill, the “Holztrift” facility, the flour mill and very importantly the Hammerherrenhaus, which is a delightful guest house with a children’s playground. The JUFA Hotel Hochkar – Sport-Resort*** is not only a popular holiday destination, but also provides an expert service for businesses wishing to holdseminars, training events, team meetings or workshops that are run over several days. Königsberg, Ötscher, Dürrenstein, Hochkar. The 4 seminar rooms at the hotel are named after these 4 spectacular mountains. The facilities provided in these rooms ensure that meetings and conferences are able to reach similar heights and scope. The rooms vary in size from 60m² to 180m² and there is sufficient room for both physical and mental activities. You will find that not only our modern technical facilities will make your event more productive, but the variety of indoor and outdoor activities available at the JUFA Hotel Hochkar will also enable you to recharge your batteries. We will be more than happy to help you with the organisation and implementation of your plans. 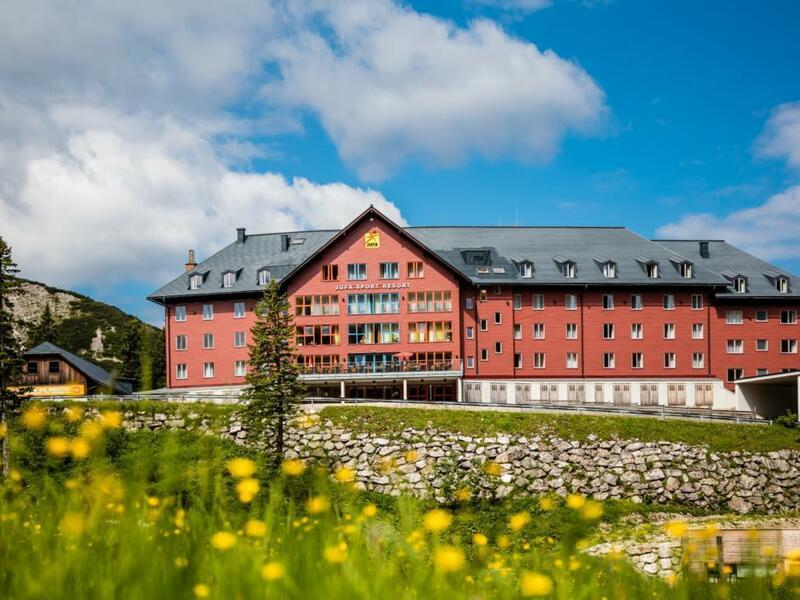 The JUFA Hotel Hochkar – Sport-Resort*** is located in the Gössling Alps at 1.400 metres above sea level. 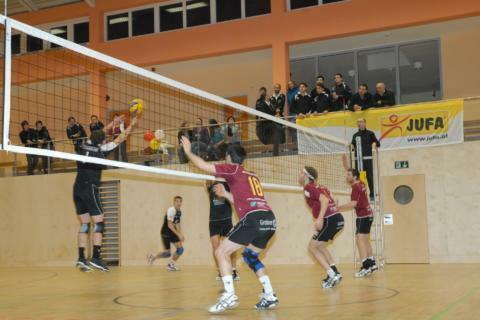 The Höhensportzentrum offers excellent professional sports facilities for sports clubs, sports associations and training camps. The quality and choice of sports and leisure facilities make the JUFA Hotel Hochkar – Sport-Resort*** the perfect choice for groups visiting the Eastern Alps at any time of the year. Modern well-equipped rooms, seminar and workshop rooms, café and restaurant, sauna and steam room, various sports facilities and various sports facilities offer an optimal infrastructure for training camps and further education. Perfect for events, via ferrata and climbing courses. A strong team spirit and a positive working atmosphere cannot be taken for granted. However, the ability to develop trusting working relationships can be learned. The JUFA Hotel Hochkar – Sport-Resort*** has the perfect facilities to suit your particular methods, whether you are supervising a programme for school-aged children or for an association or for company. Modern, well equipped seminar and workshop rooms of up to 180m² are available for your team building activities. Are you looking for an outstanding experience for your next team excursion? The JUFA Hotel Hochkar – Sport-Resort*** has some highlights ready for you: Rafting on alpine rivers, cave adventures with Flying Fox, sport climbing course and high rope course, canyoning, climbing and much more. School classes experience special moments in the high-altitude sports centre. On artificial turf pitches you learn a lot about team spirit. The JUFA Hotel Hochkar – Sport-Resort*** is an ideal place for clubs, classes and groups to develop effective team skills. "Wir waren jetzt bereits 3x dort und kommen wieder"
"Gutes Familienhotel mit mässigen Speisen"
The hotel manager Jürgen Cvitkovic and his team are available to answer your questions at any time! Im interested in the offer "JUFA Hotel Hochkar – Sport-Resort***" in the .